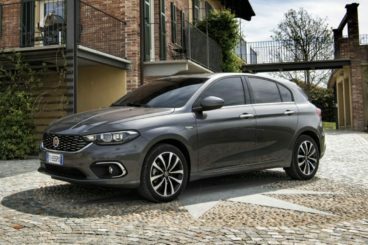 The new Fiat Tipo Diesel Hatchback is a smart-looking family car that’s practical, well-kitted out, and which offers plenty of value for money. Inside and out, the Tipo has a very businesslike vibe about it. It’s even elegant at times, while a generous amount of interior space is a massive plus. OSV takes a closer look at what it’s all about with our 2018 Fiat Tipo Diesel Hatchback review. This Italian car manufacturer is almost 120 years old. To find out more about their history, read our article here. There’s nothing inherently wrong with the way the Tipo drives per se, and on the whole, you could argue that it’s a very enjoyable car. It lacks the finesse of some of its rivals, however, and its steering lacks feel. On the other hand, its steering is well-weighted and the car can offer plenty of grip when you take bends at pace. The soft suspension encourages body lean but the ride is comfortable on the whole. Overall, the Tipo is a capable, confident car to drive but it won’t entertain you in the same way that, say, a Ford Focus will. In terms of its engines, there is a pair of diesels on offer. A 1.3-litre diesel engine sits at the bottom of the range and has a 0-62 time of 12.0 seconds. It comes mated to a 6-speed manual transmission, which is hassle-free to use. We wouldn’t say that it’s very satisfying, however. Sitting at the top of the range is a strong 1.6-litre diesel unit that produces as much as 118bhp. It has a 0-62 time of 9.8 seconds and again comes paired up with the 6-speed manual ‘box as standard. It’s an impressive engine that feels as powerful as the numbers suggest. Power delivery is flexible, even if the power has a tendency to drop off suddenly at higher revs. Put your foot down and it will make a noise, and at 2,500rpm+ it gets noisier still – especially if you’re climbing a hill. It feels as though you’re working it extra hard, although it settles down once you cruise. If you’re not swayed by the 6-speed manual, you can specify a 6-speed dual clutch automatic gearbox instead. The Fiat Tipo sports a sobering design inside that’s very business-like. It lacks the character of a Fiat 500, and there’s very little – if any – flair or imagination on display here. Some buyers might not mind it, but some will be disappointed – especially when you consider how much effort Fiat put into designing their 500 and its spin-offs. The Tipo’s cabin is awash with dark upholstery and plastics, with only the higher spec models getting brighter materials and lashings of chrome. In a word, the car feels very German. Build quality is excellent and everything feels well screwed together. It’s just frustrating that there isn’t much to get excited by. The materials are a bit mismatched, too; Fiat has used pleasant softer plastics here and there, but they’ve also used harder plastics. On the expensive models, it’s going to be hard to take for buyers. Comfort is good, however, with the adjustable driver’s seat allowing you to find the right position. Insulation is a pro, too. Is the Fiat Tipo Diesel Hatchback practical? It’s roomy and versatile, and this is the area where the car excels. Access is super easy, and rear seat space is among the best in this class. 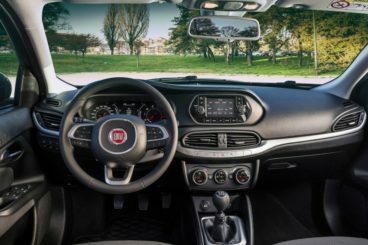 Visibility is good, the comfortable seats are a crowd pleaser, while Fiat claims there are 12-litres of storage space dotted around the cabin, which includes a big glovebox. The boot, meanwhile, measures a massive 440-litres, which makes it one of the biggest in this class. Fold the rear seats, though, and the load space slopes. A high loading lip is also an issue. Is the Fiat reliable? Read our honest summary here. Standard kit is good, with the entry-level model getting chrome door handles, audio controls on the steering wheel, remote central locking, front electric windows, Bluetooth and a digital radio. 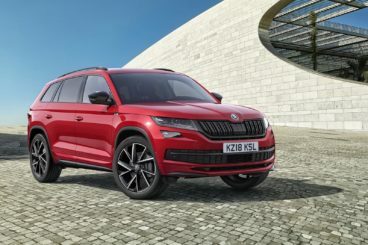 The Easy model adds 16” alloys, rear parking sensors, front fog lights, LED daytime running lights, electric rear windows and a 5” uConnect touchscreen infotainment system. The Lounge model rounds things off with climate control, TomTom sat nav, extra chrome, a rearview camera and automatic lights and wipers. In terms of how safe the car is, the Tipo was only awarded 3/5 when it was crash tested by Euro NCAP. It scored poorly for child occupant protection, and while this will concern some buyers when you add autonomous emergency braking (which is an optional extra), Euro NCAP does judge the car more favourably – it adds an extra star. That said, it’s a shame that adaptive cruise control isn’t even available as an optional extra for the entry-level model. Prices for the new car start out from £13,800 and rise to £19,800. For more information on our leasing deals, you can check out our page here. In terms of its running costs, the 1.6-litre diesel engine offers a fair amount of power but it’s also very economical. It can return as much as 76mpg on a good day and emits less than 100g/k of CO2. Meanwhile, the 1.3-litre 93bhp diesel – which is the least powerful of the two diesels – actually emits slightly more CO2. However, both engines have a BiK rating of 21%. What’s also worth pointing out is that the bigger diesel isn’t available with the entry-level Tipo and costs £2,000 more to buy than the smaller engine. For its price, this is a seriously value-for-cash car that’s hard to beat in pure money terms elsewhere. While not quite as big as some rivals, there’s plenty of room for you and your passengers. Even on longer trips, there’ll be few complaints. An easygoing driving experience is the order of the day here, which is exactly what buyers crave. Okay, it’s easy to drive – but it’s also unexciting and this will count against it with some buyers. It looks smart enough but it lacks style. Let’s see how the car fares against its rivals in the comparison section of our 2018 Fiat Tipo Diesel Hatchback review. The new SEAT Ibiza Hatchback is as good to drive as its slick looks would suggest. It might not be as big as, say, a Ford Focus but it feels just as secure on the road. Its weight is more evenly distributed than last time, and this is what helps to make it feel so composed. It’s wider than last time but doesn’t feel awkward to drive, while its precise steering and comfortable ride quality are further benefits. There are one or two caveats. The steering lacks feedback, and this ultimately means that the Ibiza is never going to be the most fun car to drive in this class. In terms of its diesel engines, there were none available at all until a few months after the car had been launched. There’s now a 1.6-litre diesel, which is offered with either 79 or 94bhp. The smaller of the two will probably be too slow for most buyers and has a 0-62 time of just 13.3 seconds. It’s weak at low revs, and we highly recommend the 94bhp variant instead. It’s got a bit more urgency, but at the same time, it isn’t as lively in the towns and cities as the petrol engines. Running costs? This is where diesels generally excel. Here, both diesels are just as economical as one another and can each return 74.3mpg economy while emitting less than 100g/km of CO2. Inside, the Ibiza is nicely laid out and well built. It’s also comfortable, and you’ll barely feel a bump thanks to an extensively reworked suspension setup. Feel, fit and finish is good, with SEAT using more soft plastics than harder ones, and it feels and looks like a cabin that will last. It’s easy to live with too and comes with an infotainment touchscreen that gets more features as you move up the trim range. 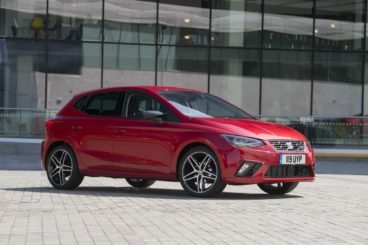 Is the SEAT Ibiza Hatchback practical? It’s wider than last time and feels very roomy for a car of this type. Four adults can sit in comfort on longer trips, and storage spaces include a large glovebox and some well-shaped door bins. The wide opening rear doors make access to the back seats easy, while the boot measures a very impressive 355-litres. The new Kia Cee’d Hatchback is affordable, practical and really quite attractive. It’s well worth a place on anyone’s shortlist if they’re looking for a new supermini. It’s not the most entertaining car you’ll ever drive, but the Cee’d is safe on the road and its predictable handling will appeal to buyers in this market. The car is also refined and composed, while light controls ensure that it’s great to drive in the towns and cities. A firm ride is a criticism, and this undermines the car’s insulation. If you opt for an entry-level model with the smaller wheels, things aren’t too bad, but the further up the trim range you go, the bigger the wheels get – and the firmer the ride becomes. In terms of its diesel engines, there are two available. A 1.4-litre unit is the smallest of the two but it’s eager and should satisfy most buyers with its 89bhp output. However, if your budget stretches far enough, we recommend the bigger 1.6-litre diesel. It’s responsive, develops 134bhp and takes just 10.2 seconds to complete the 0-62 dash. Running costs? The 1.4-litre diesel unit is good for returns of around 66.9mpg economy and emits 109g/km of CO2. Despite offering more power and pace, the 1.6-litre CRDi diesel is cheaper to run and cleaner. It returns as much as 78.5mpg and emits 94g/km of CO2. Inside, the Cee’d is nice and tidy. It’s well put together and even feels a bit upmarket. It’s solidly built, smartly designed and looks like it can stand up to the demands that family life on the road will place on it. We like its logically arranged, wraparound, driver-focused dashboard, while soft-touch plastics are a key part of the car’s upmarket appeal. The light grey trim here and there brightens things up, and all models come with a 3-spoke multifunction steering wheel. Is the Kia Cee’d Hatchback practical? It’s just as practical as its rivals. Head and legroom are both adequate, the lack of a transmission tunnel is a massive bonus for the middle seated passenger, and there are plenty of handy storage spaces here and there. These include some massive door bins and an air-conditioned glovebox. The boot, meanwhile, measures 380-litres, which makes it one of the biggest in this class. That’s still nowhere near the Tipo, and a high load lip is a nuisance, but you can fold the rear seats to extend its capacity to 1,318-litres. For the price, it’s very hard to find anything to complain about here. The Tipo is a really versatile and well-rounded hatchback that’s aimed at those operating on a budget. It’s not amazing to look at but it’s far from ugly, and while it offers a bland driving experience you can also translate that to easygoing. Hassle-free, spacious and affordable, the Fiat Tipo Diesel Hatchback is a winner in our eyes.